One (10b) shows Neptune with two seahorses and a shield of arms. The other (10a) is one of two designed for the massive doors of the Palazzo Martinengo Dobblo in Brescia. It is made up of two bound satyrs on dolphins, supporting a shield with the initials ‘G. C.’. 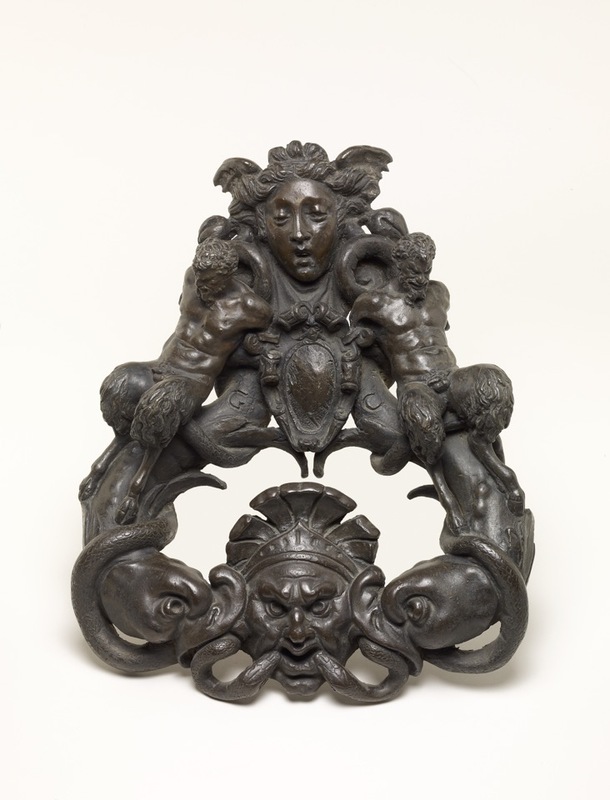 Bronze door-knocker formed of two dolphins with snakes twined around them; on the dolphins sit two satyrs, whose scroll arms support a blank shield; above shield a mask of Medusa; below shield a grotesque mask; inscribed. The companion to this knocker is in the V&A (inv. no. 588-1853). H. Tait, 'The Waddesdon Bequest', BM London 1981, pp.60 - 61 and fig. 40. For previous discussion of this piece, in which it was attributed to Andrea del Bresciano, see: C. Avery, 'Andrea di Bartolomeo di Alessandri detto il Bresciano "lavator di gettar cose di Bronzo": candelabri, satiri e battenti', in 'L'Industria Artistica del Bronzo del Rinascimento a Venezia e nell'Italia settentrionale. Atti del Convegno Internazionale di Studi Venezia, Fondazione Giorgio Cini, 23 e 24 ottobre 2007', p. 250, fig. 38. For recent discussion of this piece attributed to an unknown Venetian workshop, see: V. Avery, 'Vulcan's Forge in Venus's City. The Story of Bronze in Venice 1350-1650', Oxford 2011, p. 141 and p. 344, Fig. 10.54.